Like a lot of you out there, I find Roy Orbison a little bit creepy. Not necessarily the man, who seems to have been a nice enough guy—shy and soft-spoken, a tireless performer and family man whose personal life was rocked more than once by unimaginable tragedy. And visually Roy Orbison’s visage as anything but terrifying: an overgrown vanilla potato-man standing meekly behind a microphone and too-big guitar, hiding under sunglasses and a jet-black haircut shaped like a scarab’s carapace; a gentle figure, someone who you’d like to protect, like an old bloodhound that was never much cut out for the sporting life. No. It’s Roy Orbison’s music that has always scans as vaguely ominous. It could simply be its association with David Lynch movies—1963’s “In Dreams” is featured prominently in Blue Velvet, and 1961’s “Crying” informs a pivotal moment in Mulholland Drive—or it could be the degree of dark, vaguely (or maybe even overtly) campy melodrama that the dearly-departed Texas-bred balladeer managed to so efficiently infused into his biggest hits. It’s appropriate, I think, to frame Orbison’s music in cinematic terms in the ramp-up to discuss the singer’s truly wonderful 1988 TV special (later released as DVD and concert album) Black and White Night. As stated, I’m obviously not the first person to latch on to the inherent lurid drama apparent in Orbison’s operatic pop classics, and the entire Black and White Night project—first broadcast on Cinemax and later appearing as a perennial pledge-drive favorite of our local Salt Lake City PBS station in the 1990s—is soaked in the atmospherics and pretensions of film noir and bygone Hollywood glamor. I can’t stress this enough: you really need to watch Black and White Night to get the full effect. Luckily, pretty much the entire thing is on YouTube. The combination of Orbison’s performance with the film’s striking monochrome visuals, art deco set design, self-consciously formal attire, and omnipresent cloud of low-rolling cigarette-smoke atmosphere really helps sell the dramaturgy of the music, like a fancy-pants wine pairing that brings out the full flavor of a gratuitously overpriced steak. 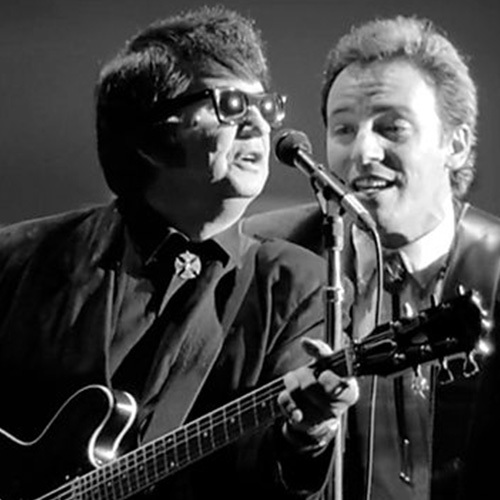 Filmed on September 30, 1987—just a little more than a year before Orbison’s 1988 heart attack death at age 52—Black and White Night feels completely free of 1980s trapping, conjuring instead a sense of otherworldly, extra-temporal cool. The location helps, filmed in Los Angeles at the now-demolished Ambassador Hotel’s famed Coconut Grove nightclub. And even though he would be dead just 15 months later, the concert (a victory-lap “best of” set featuring everything from “Oobey Doobey” to “Pretty Woman” to “Claudette,” “It’s Over,” and more) finds Orbison at the peak of his career, coming in the midst of a Reagan-era revival that found the singer’s popularity and public profile surging. Highlights from the performance include all the vocal pyrotechnics and lurid lovers-leap melodrama you might expect: “Crying,” “Only the Lonely,” “In Dreams,” and a very hair-raising “It’s Over.” Some of my own personal under-the-radar favorites include the exotic “Leah,” with its kamikaze emotional dynamics and burst of aquatic percussion, which—to me—suggests bubbles churned up by the fin of a passing mermaid; and then there’s the stupidly catchy “Claudette,” which bounces along like clay roller skate wheels jauntily hopping the boards of some 1950s beachfront. Things culminate in a Rock-and-Roll-Hall-of-Fame- style, all-hands-on-deck pile-on rave-up of “Pretty Woman,” presaging the song’s cooption by the Gary Marshall blockbuster by two full years. When Orbison died, yet another of the few precious remaining threads to rock’s first decade was severed. It’s a gift that such an indelible performer was captured in such an indelible way—featuring not a rickety-sounding legacy-artist relic, but rather a currently relevant artist at the peak of his concert powers. Roy Orbison was a true original who, creepy or not, deserves to be remembered and revisited. No need to adjust your TV set—that’s the way it’s supposed to look.